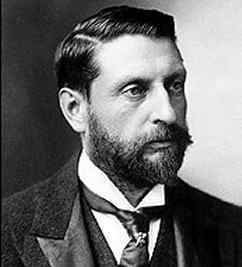 Henry Rider Haggard was born in West Bradenham Hall, Norfolk, the eighth son of William Haggard, a barrister and a country squire, and Ella (Doventon) Haggard, an amateur writer. In his childhood, the young Henry Rider was seen as the family dunce by his father. Haggard was not sent to a good public school like his brothers, but was instead educated at a London day-school, although privately, and Ipswich Grammar School. After failing the army entrance, Haggard went to Natal in 1875 as a secretary to Sir Henry Bulwer, Governor of Natal colony. In 1877 he joined the staff of the special commissioner. The next year he became Master and Registrar of the High Court in the Transvaal. For the rest of his life Haggard viewed with understanding the British colonial policy, sharing in the attitude of his friend Rudyard Kipling. On the other hand, he also traveled widely and saw the dangers of European intrusion. Thus in the end of King Solomon's Mines Haggard left the lost land of the Kukuanas to continue its own separate development. During his years in Africa, Haggard got acquainted with the Zulu culture. It is said, that he had an affair with an African woman, a profound relationship, which perhaps influenced his portrayal of women and subsequent psychoanalytic interpretations of his works. Among his devoted reader was Carl Jung, who used the novel She (1887) as an example of anima. According to Jung, the anima is an archetypical form, expressing the fact that a man has a minority of female genes. Haggard's Queen Ayesha is an unmistakable anima type - the ultimate guide and mediator to the inner world. The idea has also connections with the observations of James Frazer in his classical study The Golden Bough. Haggard's idea of a journey into the "darkest Africa," which turns into a spiritual search, has been used by a number of writers, including Joseph Conrad in Heart of Darkness (1902). Ludwig Horace Holly is the narrator of the hallucinatory She. The story depicts an adventurer, Leo Vincey, who receives a mysterious legacy from his father. He goes to Africa to search for the truth behind the death of an ancestor, Kallikrates, who was an Egyptian priest slain by an ancient sorceress She-Who-Must-Be Obeyed: Queen Ayesha, a 2000-year-old ruler of the Lost World of Kôr. With his friends, Leo travels through dangerous regions and reaches catacombs of the Kingdom of Kôr. There they encounter She, the white Queen of the Amahagger people. "I could clearly distinguish, however, that the swathed mummy-like form before me was that of a tall and lovely woman, instinct with beauty in every part, and also with a certain snake-like grace which I had never seen anything to equal before." She tells that her name is Ayesha. "My empire is of thy imagination," she says. Holly tries to teach her doctrines of Christianity but she answers: "The religions come and the religions pass, and civilizations come and pass, and naught endures but the world and human nature." She saves the life of Leo who is dying after being wounded in a fight with cannibals. Ayesha sees in him Kallikrates. She promises to make him live forever if they walk together into a pillar of flame. Ayesha enters the Fire of Life at the heart of a volcano and emerges from it immeasurably old. She dies and asks Leo to remember her in her eternal youth and beauty. "'Kallikrates,' she said in husky, trembling notes. 'Forget me not, Kallikrates. Have pity on my shame; I die not. I shall come again, and shall once more be beautiful, I swear it - it is true!'" Ayesha disintegrates; she is swept back to nothingness. The story was followed by two sequels, Ayesha (1905), in which Haggards asked, "Who and what was Ayesha, nay - what is Ayesha?" and Wisdom's Daughter (1923). After Haggard returned in England in 1880, he married a Norfolk heiress, Mariana Louisa Margitson. They moved to Transvaal to Haggard's ostrich farm. When Transvaal had to be ceded to the Dutch, they went back to England, where Haggard continued his law studies. The death of his son in 1891 was a deep blow. Haggard was admitted to the Bar in 1884, but showed little interest in practicing his profession - he had other plans. After retiring to a Norfolk country house, Haggard devoted himself to writing. He had earlier published a study of contemporary African history. His first books, Dawn (1884) and The Witche's Tale (1884), were undistinguished. According to a story, when R.L. Stevenson's Treasure Island appeared in book form in 1883, Haggard did not think much of it, and made a five-shilling bet with his brother, that he could write a better story. The outcome, created in six weeks, was King Solomon's Mines, a story of a group of treasure hunters searching legendary diamond mine in a lost land. In the story Sir Henry Curtis, Captain John Good and the veteran hunter Allan Quatermain, accompanied by Umbopa, their native servant, set off to reveal the fate of Curtis's missing brother - he has gone to look for the treasure of King Solomon in the land of Kukuanas. They cross terrifying deserts, nearly freeze in the mountains, and after a long journey, they reach their destination. Umbopa turns out to be a king, and he wins the villainous King Twala, who dies in the combat with Curtis. The adventurers find Solomon's mines, but are left to die in an underground vault by Gagool, the horrific witch-doctor. After an escape they find Curtis's brother and return to the civilization. The adventure tale became a sensation, and Haggard's book has been in print ever since. Haggard repeated his success with three novels set in Africa - She, Jess, and Allan Quatermain, all published in 1887. In Allan Quatermain the heroes from King Solomon's Mines, Sir Henry Curtis and Captain John Good, return to Africa, after being disillusioned with Western culture. Accompanied by Allan Quatermain, they journey to the lost land of Zu-Vendis, where Curtis becomes a king and Quatermain dies. However, Quatermain appeared again in several other novels. In Allan and the Ice-Gods (1927) the hero ingests a hallucinogenic drug and finds his mind transported to the body of a prehistoric caveman. The author's fantasy and myth-making later inspired several film directors. Allan Quatermain (1987), directed by Gary Nelson, was a follow up to 1985's King Solomon's Mines (1985), directed J. Lee-Thompson and starred Richard Chamberlain and Sharon Stone. The favorite adventure novel has been filmed half a dozen times, but none of the films have captured the spirit of Haggard's original work. At the age of thirty-four, Haggard had become a household name. He published anywhere from one to three books a year, in which the setting ranged from Iceland to the South Seas. Haggard also tried his hand in several forms of the novel: psychological (Mr. Meeson's Will), historical (Cleopatra) and fantastic (Stella Fregelius). During his career, he wrote over forty books. Many of his titles referred to a female character or attribute - Montezuma's Daughter (1894), Pearl Maiden (1903), Queen Sheba's Ring (1910), and The Virgin of the Sun (1922). Although the Victorian age was the first Golden Age of the ghost story, Haggard's sole attempt in this genre was 'Only a Dream,' published in Smith and the Pharaohs (1920), a collection of short stories. With the editor and historian Andrew Lang, Haggard wrote a sequel to Homer's Odyssey, The World's Desire (1890). Eric Brighteyes (1891) was Haggard's excursion into the Norse saga. In 1895 Haggard stood unsuccessfully for Parliament for East Norfolk. Between the years 1912 and 1917 he traveled extensively as a member of the Dominions Royal Commission. Haggard was an expert on agricultural and social conditions in England and on colonial migration. His books on farming, such as The Farmer's Year Book and Royal England, were based on long journeys through the country and thoughtful research. For his non-fiction, such as The Poor and the Land (1905), and for his government services, Haggard was knighted in 1912. In 1919 he was created Knight Commander of the British Empire. Haggard died in London, on May 14, 1925. He left behind four completed novels. Three of Haggard's siblings - Andrew, Edward, and Eleanora - also published fiction, Eleanora under her married title, Baroness Albert D'Anethan. Like his friend Rudyard Kipling, who celebrated the heroism of British colonial soldiers, Haggard believed in the British Empire. His works are full of action in colorful locations. There his protagonists find exotic, hidden societies, and encounter many dangers and characters with strange powers. In this, his works anticipated Edgar Rice Burroughs' Tarzan books or the John Carter stories set in Mars, in which the lost world idea was applied to science fiction. Haggard's own mythological world can also be seen as a precursor of H.P. Lovecraft's Cthulhu Mythos stories. Although Haggard's novels first were written for adults, several of them belong now to the juvenile literature. Some of Haggard's opinions, especially his belief of a Jewish worldwide conspiracy, have shadowed his later reputation and otherwise open-minded approach to foreign cultures. Moreover, the Haggard bloodline included Jewish and Indian relations. Haggard's diaries, published in 1980, reveal his curiosity to a wide variety of subjects. His fascination with the Zulu culture, based on knowledge of history and traditions, can be seen in his portraits of Umbopa, the rightful king of the land of Kukuanas in King Solomon's Mines, and the heroic Umslopogaas in Allan Quatermain, as well in the Zulu trilogy Marie (1912), Child of Storm (1913), and Finished (1917). Also in Montezuma's Daughter, set in Mexico at the time of the Spanish conquest, Haggard showed sympathy for a threatened culture. Secrets of Haggard's private life - although married to another, he lived for years close to the woman he had always loved - have revealed that behind the mask of a respected Victorian gentleman was a more complex personality than generally has been known. Alan Quartermain leads a group of explorers in the search for the lost diamond mines of King Solomon in Africa. The tale of the Zulu people under the rule of Chaka.